This event – one of three that happened at McDonald’s locations across the country – served as the kickoff for the “How Do You McNugget?” Sweepstakes, an online sweepstakes that will give one grand prize winner a chance to have their own golden moment: a trip for two to the London 2012 Summer Olympic Games. Customers can log online to www.mcdonalds.com/howdoyoumcnugget and must correctly identify how Olympians and athletes at these local events “McNugget.” They can find the answers by watching Olympian videos online at www.mcdonalds.com/mcnuggets and following the #HowDoYouMcNugget? 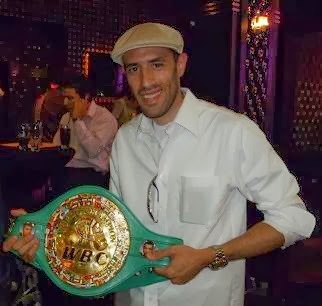 hashtag feed and event updates on Twitter. 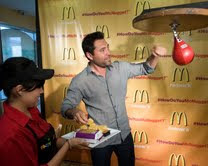 In the photo, Oscar De La Hoya is showing consumers how he "punches it and crunches it" for his McNuggets.